SSPA provides services in the areas of ship design, submarine designs, acoustic signature, vessel testing, systems engineering and maritime operations. SSPA's expertise in hydrodynamics, underwater acoustics and simulations is used in the design of ships and marine structures, and in the development of simulators. There is a strong need for thorough ship systems-engineering design. Following the experience from the design work several ship projects (e.g. the Visby Class corvette), SSPA has developed, on commission from the Swedish Defence Materiel Administration, tools for high-level system performance analysis of dynamic systems. 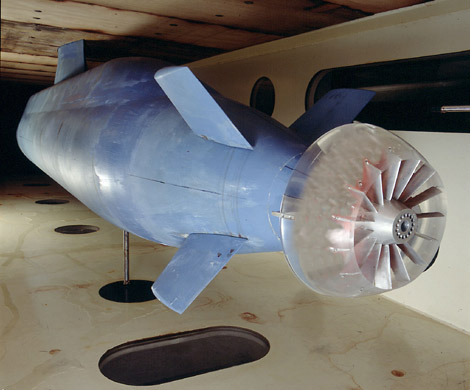 The hydromechanics design work of the IZAR P650 submarine included extensive model tests, development of propeller geometry, manoeuvring simulations and speed power predictions carried out by SSPA. 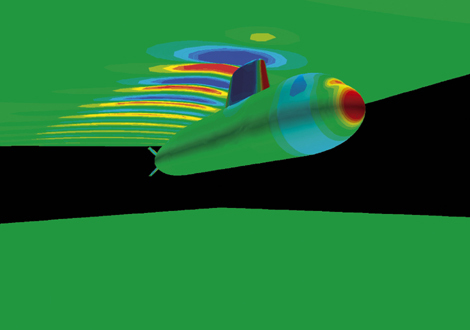 Design and model experiments on pumpjets for submarine designs have been conducted by SSPA. Futuristic yacht travelling at speed. The 65-knots fast 36m motor yacht 118 Wally Power was a milestone in yacht design: the SSPA predictions based on model tests were fully proven at sea trials. Computational Fluid Dynamics (CFD) calculations of wave pattern signature and pressure distribution on a 60m generic submarine travelling at 8 knots in shallow water; SSPA utilises the CFD codes SHIPFLOW and FLUENT. Physical model testing will continue to be an important tool in the process of developing ships and assessing their performance. SSPA's naval test facilities have the capability to perform most kinds of model testing (including a Towing tank, a large cavitation tunnel, and a seakeeping and manoeuvring basin Maritime Dynamics Laboratory). Photo at the top: The design of the Visby class corvette is one example of the long and successful tradition of co-operation between SSPA and the Swedish Defence Material Administration and the Royal Swedish Navy.